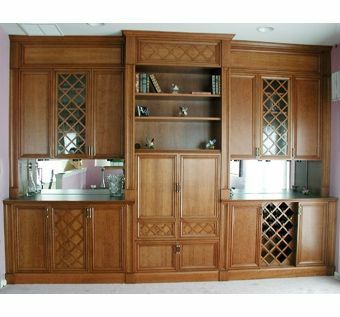 The design elements of this piece came from the wine rack the client wanted to be included in the unit. The cross hatch motive was carried into the door panels and other areas. A large screen TV is found behind the central retracting doors. The two side areas are for serving for social gatherings. Mirror is found behind the serving counters, and glassware is displayed behind the upper glass doors.